This article will give you a general idea about CSTE certification exam paper pattern. I have included some sample questions and answers for the CSTE mock test paper. You can refer to these questions and can judge the pattern of descriptive answer paper. If you need objective type questions from CSTE paper you can refer our previous article on CSTE objective type question answers. Also, you can download some more sample papers from our ‘Downloads' section. a) Boundary Value Analysis: A process of selecting test cases/data by identifying the boundaries that separate valid and invalid conditions. Tests are constructed to test the inside and outside edges of these boundaries, in addition to the actual boundary points or A selection technique in which test data are chosen to lie along “boundaries” of the input domain [or output range] classes, data structures, procedure parameters, etc. Choices often include maximum, minimum, and trivial values or parameters. b) Equivalence testing: The input domain of the system is partitioned into classes of representative values so that the no of test cases can be limited to one-per-class, which represents the minimum no. of test cases that must be executed. c) Error guessing: Test data selection technique. The selection criterion is to pick values that seem likely to cause errors Error guessing is based mostly upon experience, with some assistance from other techniques such as boundary value analysis. Based on experience, the test designer guesses the types of errors that could occur in a particular type of software and designs test cases to uncover them. Example: For example, if any type of resource is allocated dynamically, a good place to look for errors is in the de-allocation of resources. Are all resources correctly deallocated, or are some lost as the software executes? d) Desk checking: Desk checking is conducted by the developer of the system or program. The process involves reviewing the complete product to ensure that it is structurally sound and that the standards and requirements have been met. This is the most traditional means for analyzing a system or program. e) Control Flow Analysis: It is based upon the graphical representation of the program process. In control flow analysis; the program graphs has nodes which represent a statement or segment possibly ending in an unresolved branch. The graph illustrates the flow of program control from one segment to another as illustrated through branches .the objective of control flow analysis is to determine the potential problems in logic branches that might result in a loop condition or improper processing. In the quality approach, it is the responsibility of the supervisor to make His/Her subordinates successful. The effective use of criticism is a tool for improving subordinate performance. Be prepared to help the worker improve His/Her performance. Follow a specific process in giving criticism. A) Security: anything related to the security of the application. B) Performance:- The number of computing resources and code required by the system to perform its stated functions. F) Audit Trail:-The capability to substantiate the processing that has occurred. G) Authorization:-Assurance that the data is processed in accordance with the intents of the management. A) Complex – anything disproportionately large, intricate or convoluted. B) New – anything that has no history in the product. C) Changed – anything that has been tampered with or “improved”. D) Upstream Dependency – anything whose failure will cause cascading failure in the rest of the system. E) Downstream Dependency – anything that is especially sensitive to failures in the rest of the system. F) Critical – anything whose failure could cause substantial damage. G) Precise – anything that must meet its requirements exactly. H) Popular – anything that will be used a lot. I) Strategic – anything that has special importance to your business, such as a feature that sets you apart from the competition. J) Third-party – anything used in the product, but developed outside the project. K) Distributed – anything spread out in time or space, yet whose elements must work together. l) Buggy – anything knew to have a lot of problems. M) Recent Failure – anything with a recent history of failure. Q #4) You are in the contract stage of a project and are developing a comprehensive proposal for a safety-critical software system. Your director has consulted you for preparing a guideline document what will enlist the user’s role during the acceptance testing phase. 1) Ensure user involvement in developing systems requirement and acceptance criteria. 2) Identify interim and final products for acceptance of their acceptance criteria and schedule. 3) Plan how and by whom each acceptance activity will be performed. 4) Plan resources for providing information. 5) Schedule adequate time for buyer staff to receive and examine the products and evaluation prior to acceptance review. 6) Prepare the acceptance plan. 7) Respond to the analysis of project entitles before accepting and rejecting. 8 ) Approve the various interim software products. 9) Perform the final acceptance activities, including the formal acceptance testing at delivery. 10) Make an acceptance decision for each product. Testing a new or altered data processing system with the same source data that is used in another system. The other system is considered as the standard of comparison. OR we can say that parallel testing requires the same input data to be run through two versions of the same application. Parallel testing should be used when there is uncertainty regarding the correctness of processing of the new application. And old and new versions of the applications are the same. 1) Operate the old and new version of the payroll system to determine that the paychecks from both systems are reconcilable. 2) Run the old version of the application system to ensure that the operational status of the old system has been maintained in the event that problems are encountered in the new application. Example: The swinging of the hammer to drive the nail. A hammer is a tool, and swinging the hammer is a technique. The concept of tools and technique is important in the testing process. It is a combination of the two that enables the test process to be performed. The tester should first understand the testing techniques and then understand the tools that can be used with each of the technique. 2) An activity that establishes and evaluates the processes to produce the products. 4) Sets up measurements programs to evaluate processes. 5) Identifies weaknesses in processes and improves them. 6) QA is the responsibility of the entire team. 1) The process by which product quality is compared with applicable standards; and the action taken when nonconformance is detected. 2) An activity which verifies if the product meets pre-defined standards. 5) Identifies defects for the primary purpose of correcting defects. 6) QC is the responsibility of the tester. represent the logical connection between steps. Finite state modeling:-The nodes represent the different user observable states of the software. The links represent the transitions that occur to move from state to state. Data flow modeling:-The nodes represent the data objects. The links represent the transformations that occur to translate one data object to another. Timing Modeling:-The nodes are Program Objects. The links are sequential connections between the program objects. The link weights are used to specify the required execution times as program executes. 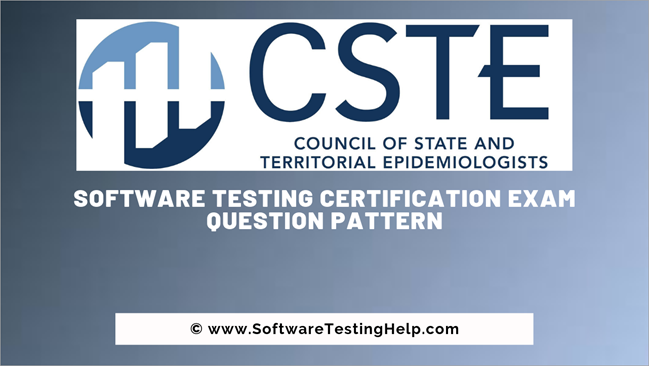 Hope this article helped you to get an idea of the CSTE Software Testing Certification Exam Question Pattern. let us know your feedback in the comments section below! and please tell me the procedure how to give the exam and tell me about the fee of this certification. Hii i m wrking in this field frm past 1 year i wnt to go fr a certification course in this field which will help me to increase my package and which can b complete within 2 months. Plzz help me out…. You are doing a great work..Keep it up……………. I am preparing for CSTE, and i want to know how many types of certifications are there in testing and how to apply for those etc. Need help and material for CSTEcertification. it would be help for the fresher..
i was simply amazed to see so many lovely feedback i am a mca 2 nd year student and i am having a hard time with programming and so i m planning for testing…. i just need to please guide me on what should i be doing next…i mean which courses should i do step by step cause i am bit confused as there are so many different certification courses… your help will be extremely helpful.. thnk you very much…..wishin you all a very happy new year in advance…. Ms Manju Could you please provide your mail id. What is the differnce between ISTQB, CSTE and CSTP? Which one has more advantage? Are there any specific month in which CSTE exam in India is held.? I am planning to give in January Feb-2013. How can I find out if exam will be held in Mumbai in these months? I am finished MCA, now i am doing job in software company. my profile software testing now i want to join software testing CSTE , i need the exact details of the courses, to know the duration of the course and also the exact fee structure to complete the course. Note : also —- the procedure to join this course. Hi please help me, i afraid of exam, because exam very Difficult, if anyone have any idea to remove afraid, or you have question and answer please send me, this exam must be success to change my life. Hi Does anybody have dumps or old question papers for “Certified Associate Software Tester” (CAST) Certification?? Please provide ur help!! Kindly help by sharing CSQA/CSTE previous test papers or exam materials. Can you please share the previous test papers and exam materials, I am going to write exam in 2 weeks. Q. 12: A project that is in the implementation phase is six weeks behind schedule. of the following actions would bring this project back on schedule? Q. 35: Where may functional testing be performed? Q. 33: Which of the following is a MAJOR task of test planning? coverage for the following fragment of code. used to provide 100% decision coverage. D. One more test case will be required for 100″ statement coverage. Q. 14: Which of the following tools is most likely to contain a comparator? A. Options i,ii,iii,iv are true. D. ii is true and i,iii,iv are false.